'Seal bombs' are small explosive devices that are used to deter marine mammals from being caught in fishing nets or from preying on catch. They are commonly used in a number of fisheries, such as purse seine fisheries that target primarily squid, but also tuna, mackerel, sardine, and anchovy, and set gillnet fisheries targeting halibut or white seabass. Seal bombs contain approximately 2.3 grams of explosive charge in a sealed cardboard tube, fitted with a waterproof fuse. They are weighted to sink below the surface of the water before detonation. Measured seal bomb sound pressure levels are 205 dB re: 1?Pa @ 1 m (Awbrey & Thomas 1987) (Fig. 1). The market squid fishery is one of the most important California fisheries in terms of landings and revenue. While technically a year-round fishery, with the season running from April to March, the fishery is closed when annual landings reach 118,000 short tons, which typically occurs between November and December (Fig. 2). As of November 2012, there were approximately 155 market squid fishing permits in California, comprising fleets in central and southern California. Fig. 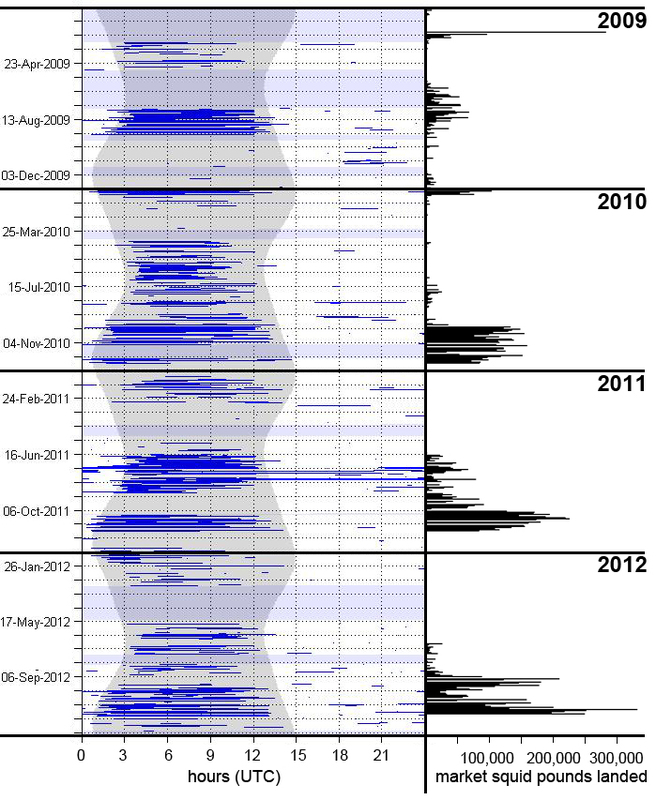 #1: Two explosions, most likely seal bombs, are shown as spectrogram (top) and time series (bottom). Fig. #2: Monthly landings of market squid as reported to the California Department of Fish and Wildlife. 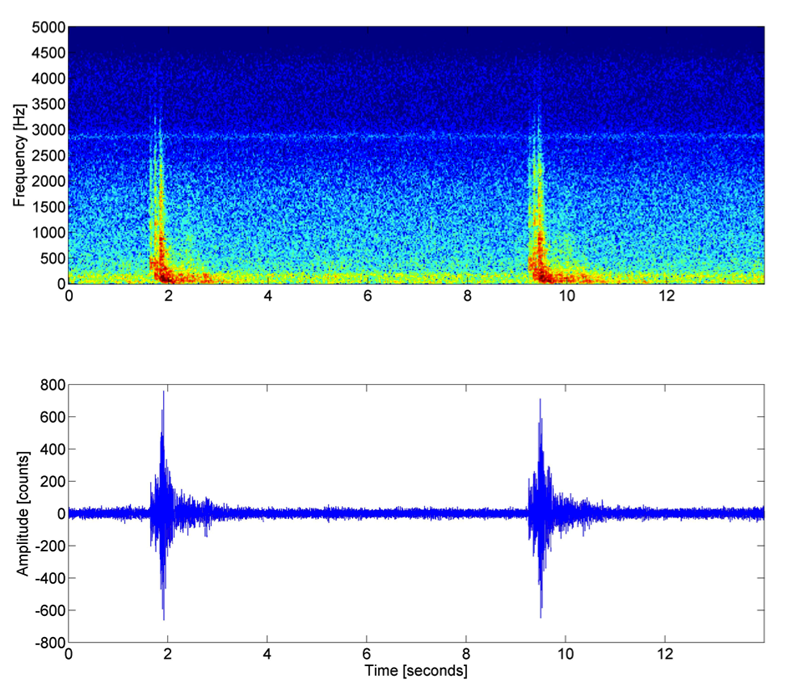 Both blue whales and beaked whales have been shown to react to some anthropogenic sounds, such as military sonars, with documented avoidance of some sound sources and interruption of feeding and/or acoustic behavior (Tyack et al. 2011, Melcón et al. 2012, DeRuiter et al. 2013, Goldbogen et al. 2013). Potential impacts of underwater explosions on marine animals, however, are unknown. We are investigating patterns of acoustic behavior of endangered blue and fin whales, and beaked whales in relation to explosive use in the Southern California region. Significant challenges exist in demonstrating changes in acoustic behavior due to external anthropogenic sources because animals exhibit natural variability; for example, they may be more acoustically active during a certain time of the day or in different seasons. Also, there may be a fluctuation in number of acoustic signals due to seasonal changes in overall abundance of a species. Explosions are detected at most sites where we have been conducting passive acoustic monitoring within the Southern California Bight, with very high numbers at a site approximately 35 nm (nautical miles) west of San Clemente Island, near Tanner Bank. Explosions occur year round, with highest numbers in late summer and fall (Fig. 3, Fig. 4). The majority of explosions occur at night (Fig. 3). At-sea explosive use by the US Navy in the nearby naval test range typically occurs during daylight, so the large numbers of nighttime detections over several months suggest these explosions are fisheries related. Between 2010-2012, several thousand (max. ~8,500) explosions per week were recorded during peak times. The maximum number of explosions detected in an hour was ~500. These large numbers of explosions, as well as their persistence over many months, were unexpected and warrant detailed analysis to determine impacts. The squid fishery may be responsible for the large numbers of explosions at this site from April through November, although other fisheries cannot be ruled out. While reported landings of squid in the acoustic study area are relatively low, when comparing pounds of landed squid in the Los Angeles area with the number of detected explosions, there appears to be a strong relationship between the two (Fig. 5). Additionally, explosions are largely reduced once the squid fishery reaches its quota. In 2011, detections of beaked whales were high when explosions were low (Fig. 4). In most other years, however, there is no clear pattern and the possible relationship between numbers of explosions and beaked whale behavior may be more complex. Apparent natural seasonal cycles of beaked whales appear to result in fewer detections in late summer and early fall, and acoustic encounter rates increase towards late fall and winter. These cycles, however, seem to vary across years and need to be confirmed at sites with less anthropogenic impact. In further analyses, we will use statistical models to address the question of the interaction of explosions and other variables with acoustic behavior of beaked whales as well as blue and fin whales. Fig. #3: Occurrence of explosions (blue) over four years at a site west of San Clemente Island was predominantly at night (grey shaded area). Purple shaded areas indicate periods with no acoustic data. Market squid in pounds landed (black) correspond in occurrence with time periods of explosions. Fig. #4: Comparison of number of detected explosions per week (top, red) and hours with detections of Cuvier's beaked whales per week (bottom, black) from 2010 until 2012. Shaded regions indicate periods with no recordings or missing analysis. Fig. #5: Number of detected explosions per month (black) during 2010-2012 in comparison to pounds of landed squid (blue) at the ports of Los Angeles. Note logarithmic scale. 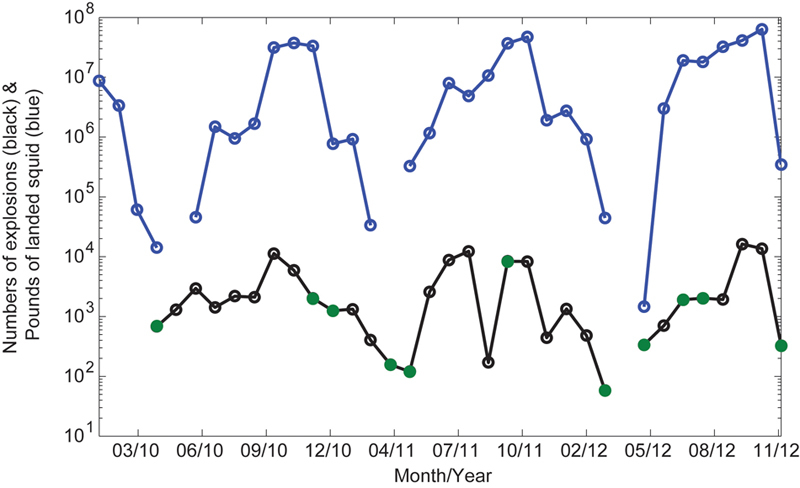 Green data points indicate months with partial acoustic monitoring effort.